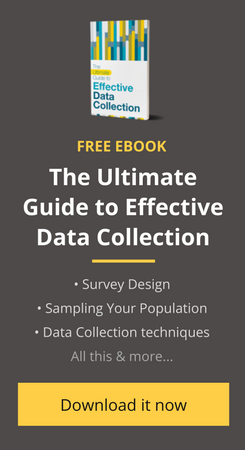 This resource is taken from the free online course by the SocialCops Academy — Planning For Data Collection. Sign up now! You want to collect all the relevant data about your program, but you also want to be judicious about it. Otherwise you’ll end up being overwhelmed by data. Remember, there is a cost to collecting and processing every data point. Just because the cost of collecting a certain data point doesn’t seem very high, that doesn’t mean that it is not adding to your overall cost. To save time, reduce costs and optimize your resources, just ask yourself these two simple questions at the beginning of your data collection exercise – what is the data that you need and whether data is useful to achieve your intended goal. Save time, effort, and money by switching to mobile data collection with Collect. Try it for free! When we’re collecting data to monitor a program, you want to collect information about the impact of your intervention. Remember, the data you collect must identify the source and the context of this information. An identifier is information that identifies the source and the context of a survey response. Your list of identifiers will depend on how granular you want your data to be. For example, if you’re interested in aggregate information about a district or province, you need not record the village name for every response. But if you’re interested in more detailed information, you’ll have to collect information about additional identifiers. Generally, more identifiers will help you pinpoint more precisely the successes and failures of your program. Subject-related information helps you uncover more insights about the goal of your survey. If the goal of your survey is to measure the impact of your program, information about the effects of the program will be classified as subject-related information. To arrive at different questions under this category, it helps to take inputs from Program Officers and Field Staff. Since they have a better understanding of the ground realities, tapping into their knowledge will ensure that you capture all relevant parameters. A common, yet dangerous, practice during data collection is collecting all the data that is available first and then going back to assessing what can be measured with the data or what part of it is even useful at a larger level. This often leads to wasted resources, time and money. In certain cases, lack of planning for data collection beforehand leaves you with not having the data you actually need! Remember, the cost of data is not just related to the computing power required to handle it; it also relates to the extra time and budgetary resources spent on a field surveyor who collects it. Then there is a cost associated with respondent fatigue — if you ask too many questions, that might lead to incomplete survey responses or it might affect the quality of responses. Thus you should plan ahead and decide what is the information you require for your analysis. Let’s take a closer look at the two questions above with the help of an example. Imagine you are a program officer at an organization that runs a program which promotes the use of educational toys for better learning outcomes for school children. You want to measure the effectiveness of your program. Coming to what information is needed — what are the possible identifiers for your data collection? You might want to get general information about the child being tested — like name, age, and gender, along with baseline information about their learning level, so class or grade level may be an identifier. You’ll need information to uniquely identify the school, so the name of the school, address, etc. may be relevant. Coming to subject-related information — the subject of your survey is to measure the effectiveness of using an educational toy in improving learning outcomes. You would want to know if students are performing better or their learning levels have gone up. You may also want to know how the teachers use the toy as a part of their classroom activity. Finally, you’d like to gather data about school infrastructure to determine if the school can keep and use the educational toy properly. Coming to what information is useful — the school collects all sorts of information about its students, and that is available to us for practically no cost. For example, they may have a record of students’ heights and weights. Or they have information about what is served for the mid-day meal, or when was the last deworming dose administered. But would this information help our analysis — i.e. measuring the effectiveness of our program? Probably not. Thus collecting this information is not useful. Ready to go into the field? Make sure that your data collection plan has the best implementation using our mobile data collection platform Collect. Whether you are in an area with limited access to the internet or have an inexperienced field staff, Collect has your back. Try it for free here. Good information and critical in M&E process. Thanks for sharing.